Planning Brick Patio Designs... What Pattern Will You Use? Planning which bricks, materials, and patterns to use in your brick patio designs doesn't need to be tricky or complicated. In fact, the good news is that most brick patio designs can be easily implemented by a do-it-yourselfer if a few simple steps are followed and the right tools are used. Long lasting and traditional, brick patios are definately worth the effort. First of all, you will need to decide if you will be going with mortar or mortarless brick patio designs. Mortar is a type of cement that is applied between each individual brick, such as the construction of a brick building. Using mortar is probably more traditional, but there are more pitfalls too. A design with mortar will be very easily damage by ground shifting, heaving, frost, and vibrations. Cracks are likely to form quickly and can be difficult to repair. If you want to use mortar, it is best left to a professional. Much more popular these days are brick patio designs that uses no mortar. Instead of using mortar, each brick abuts directly against the next one. The small void between bricks is filled in with a fine sand. This type of patio construction wears well over time and is easy to install, especially for the do-it-yourself homeowner. The most common brick to use in your "no mortar" brick patio designs is a 4 by 8 inch solid brick paver. There are other dimensions, but this is the best size to use with a mortarless plan. Thickness ranges from 1 1/2 to 2 1/4 inches. If you are planning to have vechicle or other heavy usage of your patio, you'll want to use a thicker brick. Otherwise, the 1 1/2 inch thickness will do just fine. Bricks with holes through them are not for patio or other flooring use. Specially designed paver bricks are much harder and durable. When hit with a hard object, paver bricks will have a metallic ringing sound. Often, the edges are rounded or distressed in order to look more rustic and wear better. 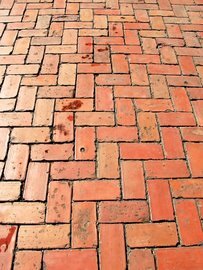 You can find brick pavers for you brick patio designs at most home improvement stores or at an area brick manufacturer. Another popular option is to use historical bricks. 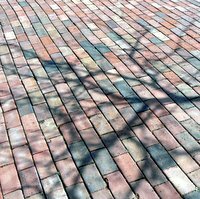 These are bricks that were once used as pavers for streets, alleys, sidewalks, or on old buildings. Using these adds character, but can also raise the price of your patio significantly. If this idea appeals to you, check out your local newspaper ads or ask around to find out where to purchase them. When you decide which type of bricks to use, you will need to figure out exactly how many you'll need to complete your brick patio design. A basic rule of thumb, if you are using 4 by 8 inch bricks, is to measure the square footage (length times width) of the area to be paved and multiply that by 5. Then add 5 percent to the total to factor for defects and wasted bricks. For example, if your patio area measures 10 feet by 20 feet, that equals 200 square feet. 200 (square feet) times 5 (approximate number of bricks per square foot) equals 1,000. 1000 plus 5 percent equals 1,050. That means you would need to buy about 1,050 bricks (assuming they are 4" x 8") to pave this patio. When in doubt, always buy more than you actually need because it could be hard to find matching brick if you don't get enough the first time. Although we'll cover the details of building your patio in a different section, please keep in mind that there are other materials you'll need. Some type of border or edging restraint is necessary. For this, you can use more brick, wood (pressure treated 4 x 4 or 2 x 4), concrete, or special metal or plastic forms made for this purpose. If you plan to use brick for your borders or edging, you'll want to make sure you add that to your total number of bricks needed. For your patio's base, you'll need crushed stone to be compacted. Sand is used to fill in between the bricks. Again, to find the specifics on these materials, please see the "building a patio" section of this site. When choosing a pattern (commonly called a bond) for your brick patio designs, you have easy options and some more difficult options. One of the easier options is the Running Bond design. This pattern will require some cutting, but if you plan right, you will only be cutting a few bricks in half. A variation of the Running Bond is the Stack Bond. It has a much more square look. Another popular option is a Basket Weave Pattern, which has many different variations. Then there are more complicated patterns. When you get in to more complicated patterns such as the Herringbone, you will be doing more cuts, often at a diagonal. You can always modify these patterns to suit your own needs. Perhaps try a common pattern set on an angle to change the look. Also, feel free to create your own brick pattern altogether. Once you do have your design figured out, make sure to do a mock up with the bricks before you actually set them permenantly. This way you can rest assured that your brick patio designs will work with the space you have for your patio and they look the way you expect.